An international team of scientists from Helmholtz-Zentrum Dresden-Rossendorf (HZDR), the University of Maryland and more, have developed a graphene-based optical detector which reacts very rapidly to incident light of all different wavelengths and works at room temperature. It is reportedly the first time that a single detector has been able to monitor the spectral range from visible light to infrared radiation and right through to terahertz radiation. The graphene detector is made of graphene on silicon carbide, along with a unique antenna. It is regarded as a comparatively simple and inexpensive construct that can cover the huge spectral range from visible light all the way to terahertz radiation, as graphene can pick up light with a very large range of photon energies and convert it into electric signals (unlike semiconductors like silicon or gallium arsenide). 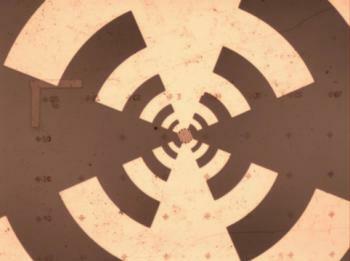 The broadband antenna and the right substrate were enough to supplement graphene and create the ideal conditions for this unique detector, that can be used for the exact synchronization of laser systems. The detector works by having the graphene flake and antenna assembly absorb the rays, thereby transferring the energy of the photons to the electrons in the graphene. These "hot electrons" increase the electrical resistance of the detector and generate rapid electric signals. The detector can register incident light in just 40 picoseconds - billionths of a second. The scientists say that the choice of substrate has proved an important step in improving this device. While semiconductor substrates used in the past have always absorbed some wavelengths, silicon carbide remains passive in the spectral range. At the same time, the antenna acts like a funnel and captures long-wave infrared and terahertz radiation. The scientists have therefore been able to increase the spectral range by a factor of 90 in comparison with the previous model, making the shortest detectable wavelength 1000 times smaller than the longest. This optical universal detector is already being used at the HZDR for the exact synchronization of the two free-electron lasers at the ELBE Center for High-Power Radiation Sources with other lasers. This alignment is particularly important for many experiments. The scientists are actually using the graphene detector like a stopwatch that tells them when the laser pulses reach their goal, and the large bandwidth helps to prevent a change of detector from being a potential source of error. Another advantage is that all the measurements can take place at room temperature, eliminating the need for the expensive and time-consuming nitrogen or helium cooling processes with other detectors.